Here you go, here's a decent group for the 300 Whisper. I'm using a 10x Tasco Super Sniper at 100 yards. Temp. was 58 degrees today. Here is a Krieger 24" Fluted Semi-Bull profiled stainless barrel with Duracoat painted flutes. Randall, just got back from Idaho spending the weekend blowing up rockchucks and squirrels. That .204 Ruger is beyond description. 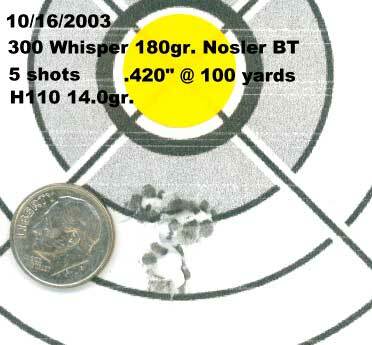 Sub two inch groups at 257 yards were commonplace -- a real tack-driver! I was finally able to go to the range with my 6.8 upper to zero the sights. 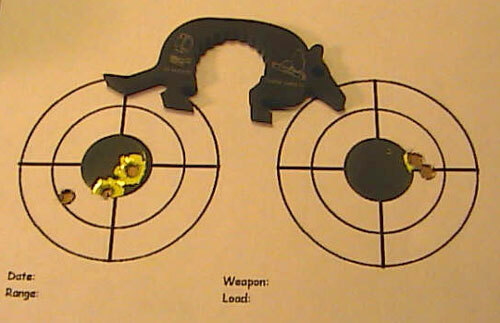 Target on left was my first attempt, I got too excited after the first two and threw the third. So I tried again with Fight4YourRights not telling me anything this time. That center disk is 1" in diameter. 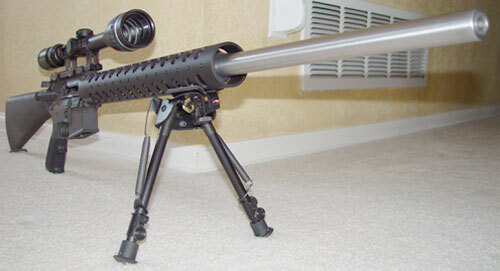 Ammo was SSA's 115gr TMJ, Barrel is a 16" 6.8 SPC range was 50yards, optic was a 3x Compact ACOG using a stock trigger. (Yes the group on the right is a 3 shot group). Brands mentioned do not suggest any affiliation with the respective manufacturers.